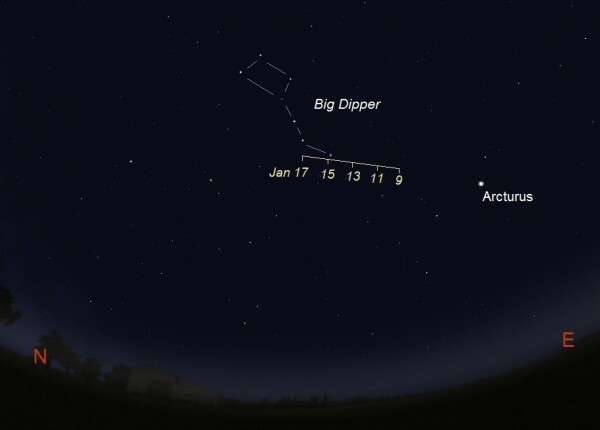 Comet Catalina ( Comet C/2013 US10 ) will reach closest Earth distance on January 17, 2016. Discovered on October 13, 2013 by astronomers at Catalina Sky Survey in Arizona, this little curiosity curtsies harmlessly at a closest distance of 110 million Km, before leaving our solar system for good. Hardly monumental, rated a magnitude 6.2-6.4 ( just short of magnitude 6 or less needed to view with the naked eye ) Catalina’s nearest Earth point is more inquisitive spark than required observance. Catalina doesn’t care if you see her or not. Her tidy 4-20 Km nucleus will go, politely as it came. Binoculars won’t give perspective to her 800,000 Km ( sometimes double ) tail, or reveal green tinged realities of a gaseous cloud trail – at best you’ll see a fuzzy cluster. Backyard telescopes with fair conditions might grant a glimpse of green comet atmosphere, but that isn’t the point of pondering Comet Catalina. A conscious decision to seek out Comet Catalina, holds the key to her passage. Mindsets content with fuzzy blobs, unremarkable definition and colourless fringes. People willing to listen to their sense of wonder, those curious enough to bother gazing skyward – that’s all Catalina needs or wants. Facing east beginning around 4:30 a.m. local time – the time on your clock from most parts of the globe – until sunrise from January 9 to 17, 2016. Comet Catalina passes very close to the stars that form the Big Dipper as it nears its closest point to Earth. Illustration by Eddie Irizarry using Stellarium.